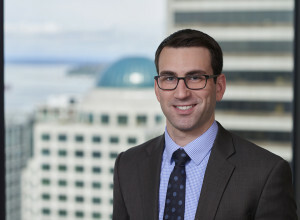 Mr. Hardy works out of Holmes Weddle & Barcott’s Seattle office practicing maritime law to include defending cases brought under the federal Longshore and Harbor Workers’ Compensation Act. He also defends cases brought under the Defense Base Act. Prior to joining Holmes Weddle & Barcott, Mr. Hardy clerked for the Honorable William Dorsey, an administrative law judge with the U.S. Department of Labor’s Office of Administrative Law Judges in San Francisco, for over two and a half years. There, Mr. Hardy worked extensively with cases brought under the Longshore Act and its extensions, various whistleblower protection acts, and other federal employment statutes. While in law school at the University of Southern California, Mr. Hardy was a Senior Editor for the Southern California Law Review, for which he received the James G. Holbrook Award for significant contributions to the publication. Mr. Hardy also interned for the Snohomish County Prosecuting Attorney’s Office, the Federal Trade Commission, and Fox Entertainment Group’s in-house employment law department. Mr. Hardy is a member of the Washington State Bar Association.